A recent study on internet penetration across top most cities in the country by Internet and Mobile Association of India (IAMAI) revealed that Mumbai happens to be at the top position with 12 million internet users. In 2012, the city had 8.3 million internet users. However, Delhi acquires the second position with 8.1 million users and saw an augmentation of 2.1 million users since 2012. Being at the third spot Hyderabad has 4.7 million internet users which was 3.6 millions in the year 2012. Chennai takes up the forth position with 4.5 million internet users that happened to be 3.4 millions in 2012. Kolkata exhibited an increase of 1.4 million users since the year 2012 and is at the fifth position with 4.4 million internet users at present. The year over year (YoY) growth of internet users as per the report is highest in Kolkata among the top cities in India. It is 47% while that of Mumbai is 45%. In spite of being the IT hub of India, Bangalore registered a growth of only 43 per cent. Pune occupies the fourth spot with a YoY growth of 37 % while Delhi is at the fifth position with 35 % YoY growth. Ahmedabad is at the lowest position among the top eight cities with YoY growth of 26%. However, as far as Active Internet Users are concerned, the top four metro cities have a 37% penetration. Hyderabad with 37 % Active Internet Users tops the chart, among the other four metro cities. 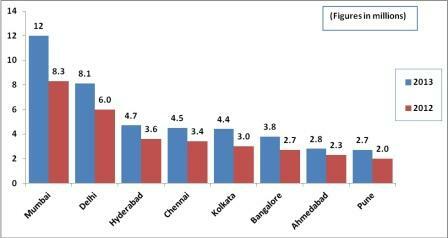 While talking about the small metros category, Coimbatore with a 40 per cent penetration is at the top of the chart.